There are a lot of things to love about Jimmy John's. Tasty food. Free delivery. Funny commercials. Thinny chips. Salt and vinegar chips. The Vito (that's an Italian sub with salami, provolone, capicola, onion, lettuce, tomato & Italian vinaigrette). The hot peppers that are so hot I order them, let the juice soak in and then take the actual peppers off before eating the sandwich. And of course the bread. Oh, the BREAD. I don't know what it is about Jimmy's John's bread, but it is soooo gooood. It also has a lot of carbs, which I'm trying to cut back on. Plus, without the bread, the calorie count for a Vito falls to 340 from 600 calories. So today, I decided to give an Unwich a try. For my first experience, it was decent. I'd give it a 7 out of 10. Some of that was JJ's fault. Some was my own. Those are not my man hands. I didn't take a before pic, so I had to Google one. 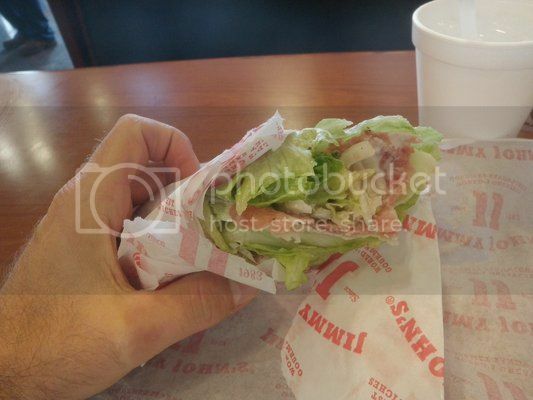 I knew I'd seen signs at JJ's before about how to eat an Unwich, so I Googled it just to school myself on the proper technique. 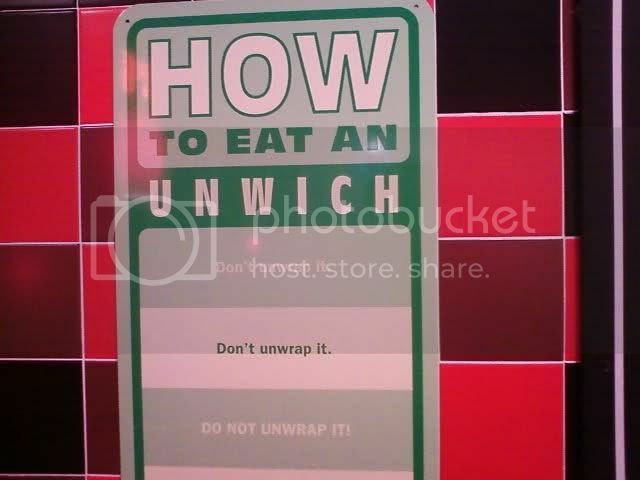 It seems the cardinal rule is DO NOT UNWRAP THE UNWICH. Then, I UNWRAPPED THE UNWICH. Yes, I did. I know I shouldn't have, but I did. The lettuce was sticking out the end kind of floppy and it just seemed awkward to eat it all wrapped up. Plus, I didn't want to get a biteful of paper. (For what it's worth, I unwrap my Taco Bell, too.) Once I had it unwrapped, then it was really awkward to eat. 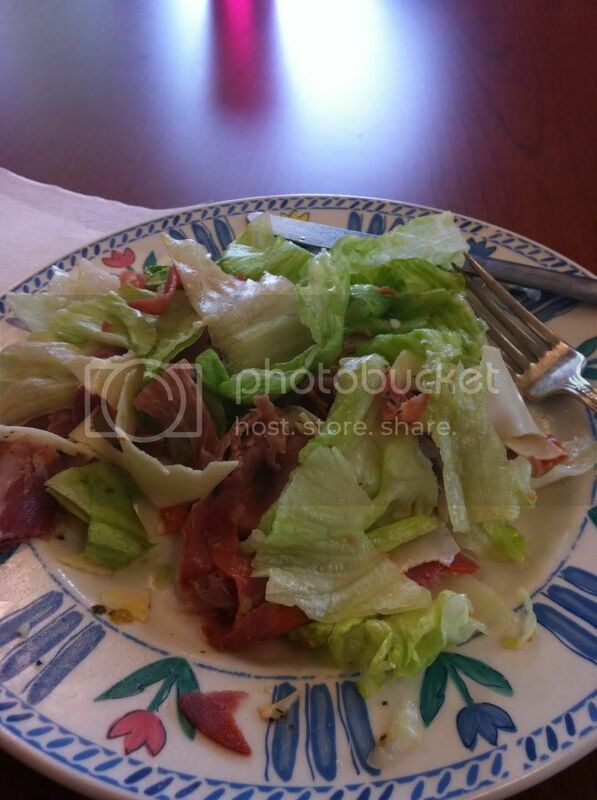 So, I got a plate and cut up my Unwich to eat like a salad. Functionally, it worked pretty well that way. Flavorfully, I kept thinking how much better this salad would be with a little more dressing and a side of that delicious Jimmy John's bread. And I knew that in about 2 hours I was going to be hungry again, which turned out to be right on the money. Speaking of money, when you order an Unwich, they charge you the same amount they charge for the sandwich. That seems kind of like a crock. That's like saying the bread is free, which it's not because if you try to buy the bread by itself, it costs 50 cents. So it seems like an Unwich should be at least 50 cents cheaper. Maybe next time, I'll just order the regular Vito (no onions and add hot peppers, please), then dump the guts onto a plate to eat with a fork and save the bread for the kids or to freeze and make garlic bread with later. I would also make sure I had some fruit or Thinny Chips to go with it. Do you wish you had an Unwich? I love Jimmy Johns! #12 (Beach Club) is my favorite and I have enjoyed a Gargantuan upon occasion! I've been tempted to try an Unwich ... probably will once I get myself back on the Low Carb wagon but ... gosh that bread is good! yum....but i have to agree with JJ, you have to keep your unwich wrapped up. There's something about that construction that makes it more like a sandwich and less like a salad. I am particularly fond of lettuces wraps with taco meet. super yum. I have an unhealthy relationship with the #9 (italian nite club). I've never unwhiched. I'm kinda a go big or go home kinda girl, especially when it comes to my stinky Italian sandwiches. I love the Vito, too - but I add bacon! I can't pass up the bread, though. It's too delicious and I am weak. :) You are so fun! I love your shared culpability with JJ. And yes, you should get the bread and save it next time for the price. Too funny. We don't frequent JJ much, but the last time I was there, I had to refrain from commenting on how freaky fast it actually was. The sandwich was made before I signed my debit card slip. ANYWAY. Unwich sounds more hearty than "salad". But really, it's good for you like a salad. Total bonus.